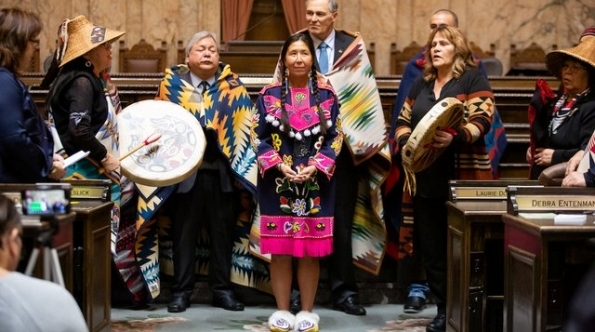 Washington State Rep. Debra Lekanoff (D), who is the first Native American woman to ever be elected to the state’s House of Representatives, was sworn into office wearing traditional regalia this week. Lekanoff, who was elected to represent the state’s 40th House district back in November, could be seen in photos from the ceremony on Monday wearing traditional Native American regalia, moccasins, beaded earrings and braids, while standing alongside members of local tribes who played the drums and sang in the Coast Salish language. “The traditional designs reflect the natural resource of salmon, berries, seaweed and her clan house, the Raven that is found in her Tlingit homelands of Yakutat Alaska,” Lekanoff’s office said in a statement to The Hill. “Native American’s names, features, foods, cultural teachings and traditional values are all interrelated to the lands, environment and resources around them,” the statement continued. Lekanoff’s election to office represented one of two historic firsts for the state’s Legislature, which also swore in state Rep. My-Linh Thai on Monday. Thai, who is from Vietnam, is the first refugee to ever be sworn into the chamber in its history. “Never before has the House Chambers felt the vibration of the drums or the Coast Salish language as a Native America joined the House membership," the spokesperson continued. "And it was an monumental to have intertwine this piece of history with the 130 years of moments that is carried in the floor of the House of Representatives." Similarly, Rep. Deb Haaland (D-N.M.), who was recently sworn in as one of the first Native American women in Congress, also wore a traditional Pueblo dress while taking her oath of office earlier this month. 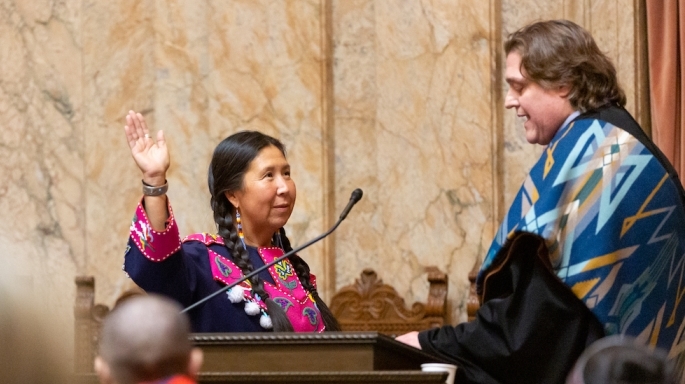 Responses to "Native woman elected to Washington State House wears traditional regalia at swearing-in"